Sea dragons, despite their name, are not a true dragons, nor even close relatives. These creatures appear very similar to a dragon at first glance. It is a large reptile covered in shimmering green reptilian scales. 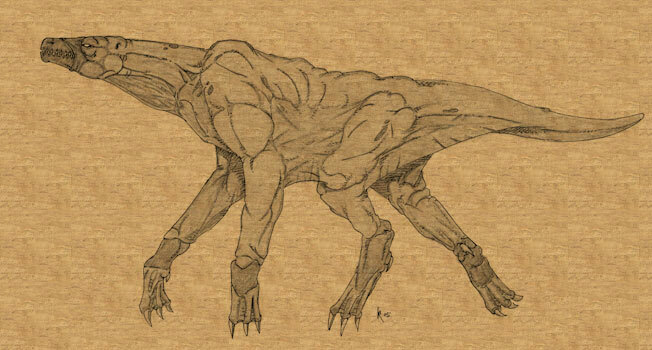 The creature measures 8 meters (26 feet) from the tip of its saurian snout to the end of its tail. Webbing between the legs, fingers and toes helps the sea dragon swim at fantastic speeds. Sea dragons are aggressive carnivores and will hunt anything they think they can catch and kill. Sea dragons feed primarily on fish, but been known to attack small boats and swimmers. They front limbs are short and, although clawed, are not very effective weapons. The sea dragon's bite, however, is formidable. The beast's gaping maw is filled with many shark-like triangular teeth and easily bite a sailor's arm off. The sea dragon has a breath weapon which is probably one reason for the creature's name. At will, the creature can expel a concentrated stream of sea water with great force. The stream of sea water can reach out to 50 feet and knock a man off the deck of a ship. The water is stored in a specialized internal bladder in the chest and expelled using muscle contractions in a muscular sheath in the throat. The sea dragon fills the bladder while underwater and can surface and expel the water every few seconds. The "breath" weapon can even be used underwater, though the force and range are much less. Sea dragons use this watery breath weapon to stun prey and knock land creatures off their feet or wash mariners overboard. Sea dragons are most common in the Sapphire Main and are responsible for most sea monster sightings and many tall tales in coastal taverns. A species of northern sea dragon, notable for its blue scales, has been spotted many times in the northern seas from Kitar to Borrell. The northern sea dragons tend to be particularly aggressive. Sea dragons are active carnivores the hunt at least once a day. They are normal creatures, having evolved over the centuries and are part of the aquatic ecosystem. Sea dragons mate once each year. The female creates a nest in sandy beaches on desolate islands and lays between 2 and 5 eggs. She will protect the nest fiercely until the eggs have all hatched. The newly hatched sea dragons immediately begin a trek down the beach to the sea. Once in the water, they are on their own and begin hunting immediately.